You knew there was gonna be some sort of pirate-skin at some point, right? Chatting in piratespeech will never be more appropriate than when you rock this baby during an Awesomenauts match. All Yo Ho's, plank-walking references, plundering references and buried treasure references will be 74.2% funnier (and totally non-cliche) if you are manly enough to tread the interstellar battlefields as Cap'n Vinnie & Seadog Spike. 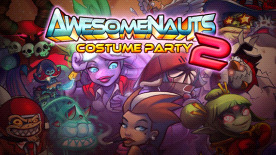 Roam the Awesomenauts battlefield as Cluck Clunk! Omelettes never contained this much aluminium! Coco has accidentally been sent back to the year 2015 by mad scientist monkey Yuri! 2015... when hoverboards had a weirdly nineteen-eighties-like design! Coco McFly must now find a way to go home in the future! Will she ever get back? Summoned by a sorcerous ritual, Demon Skølldir has entered our realm! Chaos follows in his wake! Tremble mortals, and despair for Demon Skølldir's fiery fists of doom are upon you! Double-O Yuri's instructions are implicit. License to kill. From elegant clubrooms to exotic islands, Double-O Yuri carries out the Secret Simeon Service's dirty work. An action-filled adventure of intrigue, treachery and romance. In the world of adventure, the highest number is Double-O Yuri! Them superfly leather-suede jeans. That's Pimpin'! That black belt of bling. That's Pimpin'! Them "eyes on the money" glasses. That's Pimpin'! That gold 'n diamond "smack you fools" cane. That's Pimpin'! Pimpy G. is pimpin' and you know it. Who needs practical body armor anyway when you're carrying a retractable sniper cannon? You might as well dress up and look fabulous as you lay down a hail of sniper fire upon your enemies!